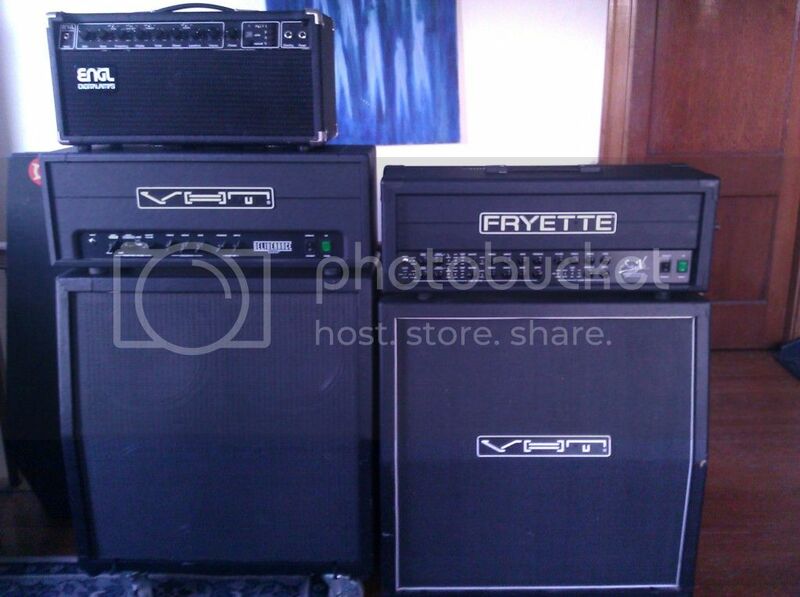 The cab on the left is a cheap no-name cab I had custom-built to look good with the D60 head. It's a front-loaded cab with P50Es in it. I took this pic immediately after comparing it side-by-side with the FB412 for the first time, and there's a surprisingly huge difference in sound between them...the FB412 wins! Is that ENGL that model that allows you to store 4 presets? I remember seeing one of that type, a combo, in a local pawnshop at a great price way back in the early 90's(I think?) Had a cool footswitch to access the presets. It was gone when I went back, but I always wondered what kind of bad to the bone good deal I missed out on??? I dig the rest of your rig too!! Is that D60 a total rocker??? I'd sure like a month with one!! 2 Banks with 4 presets each, for a total of 8...and this is in an amp from 1985! Unfortunately, I don't have the footswitch, and there's something up with the preamp in mine. Honestly, at the moment, it's more useful as a cool conversation piece than an amp, but it has the potential to sound good if I can get this preamp issue fixed. The Deliverance is awesome....a few years with it made me trade my Engl Savage 120 (which I owned for about 4-1/2 years...the longest I'd owned any amp to date) for the Sig:X at the end of September. The Deliverance will soon overtake the Savage as the amp I've owned longest!